You're gonna need HeatHazeWithAlphaDepth.vfp if you want to use material from the video. My Blender skills are pretty rough but considering Vertex anims aren't near as much of a pain as adding bones, I'd be really interested in learning this method. Animations are the one thing I'd really like to press more in my skill set. Probably targeting cloth simulations to start with, but I'm really curious as to how this would look with a fully sculpted out cloth asset (like a flag or a curtain). The problem with physics simulations is that they don't naturally loop so you have to use some tricks to do that. You could make a simple flag with a wave modifier too, but it wouldn't be as realistic. If I were to have enough control on the frames I would try and make a longer simulation. Find a low point in velocity (somewhere in the middle of the simulation) and split the animation frames and loop them back to the start. Practically what you'd do to seamlessly loop a gif. Then again I don't know how the organizational tools are for that kind of method. In theory it's simple but if the tools don't permit it would be practically useless to attempt. You'd heard my previous thoughts at animations machines in the past, but I am serious at getting some fundamental animation skills down eventually. I just didn't know if I was gonna try for Blender or wait till I move from Softimage to MayaLT. Now if only the water physics were a thing we would see the boat bob up and down. About reflections that is totally the contrary to what it should be, the far away the water is more reflective it should be to the point of being a perfect mirror, that is the principle of Fresnel, refraction on the other end and afaik works has it should, the far way the water surface is the more opaque it is in relation to your eyes, the principle of IOR. If some day you guys or anyone working with idtech 4 implant PBR, this stuff will need to be considered. Btw about vertex shader vs md3 animation, there's some things a vertex shader can give you guys that md3 can't, one better performance (runs on the GPU), two no md3 vertex and frame limitations, three dynamically change the displacement at run time, for example make the water waves bigger or spiderweb motion faster based on wind strength, four less complex to setup and more noob friendly, no need to know how to animate on a 3D app, just change some shader parms and that's it and this paired with normal map or parallax map animation is very powerful. p.s - Can't you apply the SteveL soft particle edges to the water surface? In that way you don't have that hard line at the shore. Edited by HMart, 21 February 2017 - 11:13 AM. In time with the crests of the wave's, in fact if you know the frequency could you not have a script that that stated the animation and a func_bob entity at the same time. Hum, don't really see why not, just make a idle animation where the boat rocks a little side to side and the up and down movement could be made with a func_bob, is just a matter of trying it. It's possible to bake the simulation and export to .mdd files. Then you can use two Mesh Cache modifiers, like this guy explained. I haven't tried that yet. Here's the same animated mesh with similar water shader to what I used here. Unfortunately, as you can see it's buggy and water geometry disappears. If it was not for the shader bugs that water would be almost perfect. And perhaps some day a LOD system could be introduced into the engine, specially for water and terrain like dynamic tessellation, one can dream. Here are the files for the second test. I use player model's skin set to nodraw to disable reflections. Hood is still visible in the reflection. I updated the animated flag. 250 frames. In the video it's played at 60 FPS. I thought that disappearing of md3 meshes was because of mirror rendermap, but it also happens without it. Interestingly when you turn on the lantern some of the models are rendered again. Here's the md3. Evening chap, could I make a request for a couple of small but different animation for a cobweb? 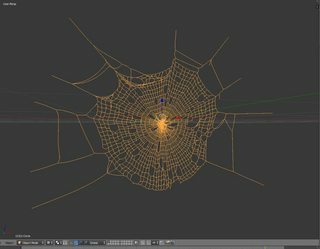 You can make a convincing web texture using cloth physics in Blender. Here's the md3 file. It's 275 frames. I can export it in different size. That really looks awesome, btw i don't know how heavy on performance MD3's really are, compared to bone animation but if they are heavy, then IMO is somethings that would benefit immensely from a LOD system, for example at longer distances instead of always showing 275 frames you could bring them way down, the animation will not be that smooth but at the distance i bet is almost unnoticeable. Cobwebs is not something that you will use very often so perhaps the work of making a LOD system just for this is not worth it, but with LOD you could have a room full of cobwebs, for a big spider lair or something and potentially have better performance. Edited by HMart, 18 October 2018 - 05:27 PM. I don't know if you can set FPS per model. Right now there's one script per map where FPS is set. It's tied to game's FPS here. You could make a shorter version but I don't know if that would have any benefit. You could make a static LOD. Yes a static LOD seems to be a logic thing to have. Here's the blend file. First layer is cloth physics simulation. Then I exported it to .mdd file and re-imported using mesh cache modifier (second layer). To export use "md3 (+shaders)" addon v1.6.4. There's another one that doesn't work. Tangentially related to the MD3 animated water: did anyone see this? It's fhdoom, it's a bit buggy but I really dig it. Afaik this should work in vanilla though. [...] I noticed TDM has taken to use MD3 to achieve a similar result which is probably faster anyway. When I tried it, after changing "inherit" to "spawnclass" I got splashes but no visual model (I tried both material and texture paths in the 'shader' line), so maybe fhdoom did something to enable it. I've seen this idclass on fhDoom before but it was totally commented out! Like the md3 loader i never thought this would work so i personally let it pass, what more is hidden on this engine! It turns out people were proposing to remove MD3 support in 2014 because it wasn't being used. It that cleanup effort had gone ahead this thread wouldn't exist. Yes sometimes some decisions are bad decisions but at the time they seemed to be the best ones, unfortunately we don't have the ability to predict what the future brings. Fortunately in this case no one removed md3 support but even if they did, this ability could be made by other means, for example using vertex shaders.